These 4-ingredient Banana Chocolate Wonton Bites are the perfect sweet treat to indulge your cravings for dessert or a snack. 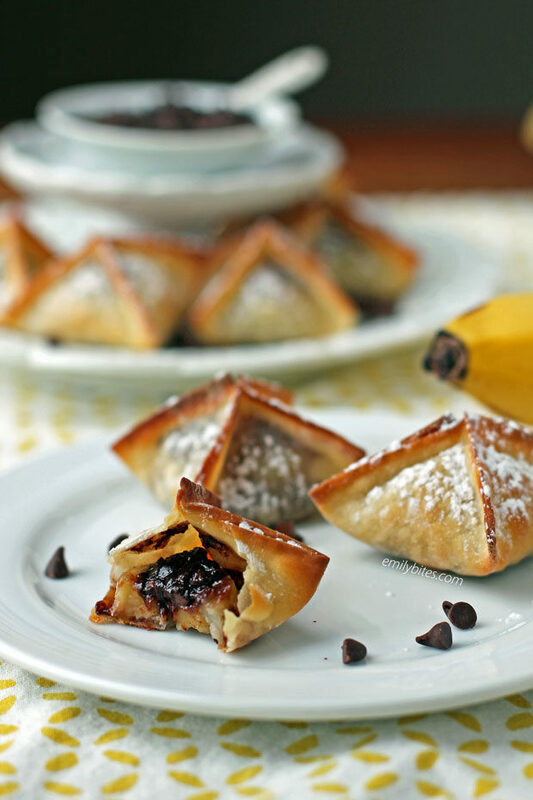 Crispy on the outside and filled with warm, gooey chocolate and bananas, what’s not to love? 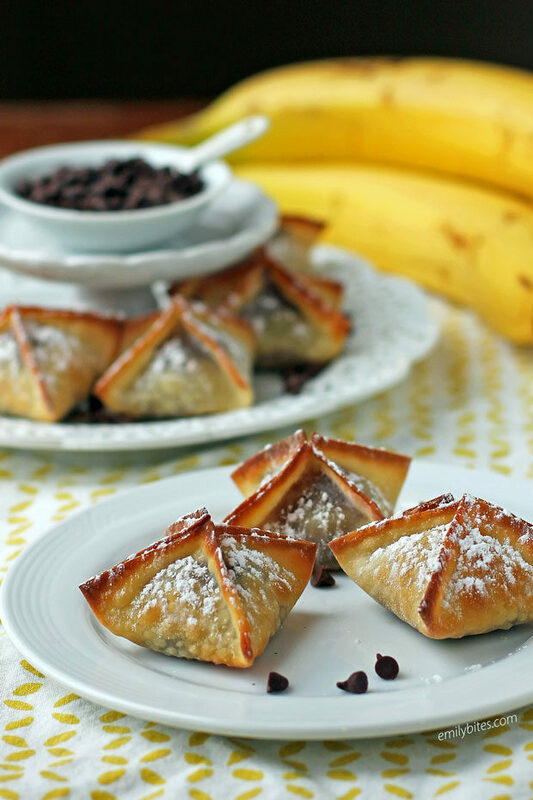 Not only do these Banana Chocolate Wonton Bites taste super indulgent, they’re really simple to make. You can even easily adjust the recipe to make less or more, so if it’s just you or a whole party, this recipe has you covered! I love how adorable they are when finished. It looks like you spent way more than just a few minutes putting them together! Even better, each of these sweet Banana Chocolate Wonton Bites is just 40 calories or 1 WW Freestyle SmartPoint. One point for a sweet treat is a real WW Freestyle bargain! Y’all know I love wonton wrappers. Looking for more ways to use them? I’ve got you covered! Check out my recipes for Caprese Wonton Bites, Pizza Wonton Cups, Chili Wonton Cups, Spinach Artichoke Wonton Bites, Asian Chicken Wonton Cups, Chicken Bacon Ranch Wonton Cupcakes, Mixed Berry Mini Tarts, Reuben Wonton Cupcakes, Chicken Parmesan Wonton Cupcakes, Mini Cinnamon Apple Tarts, Taco Cupcakes, French Dip Cupcakes, Berries and Cream Cinnamon Dessert Cups, Buffalo Chicken Cupcakes, Cheeseburger Cupcakes, Lasagna Cupcakes and many more in the wonton category of my recipe index! These Banana Chocolate Wonton Bites are an easy 4-ingredient dessert to indulge your sweet tooth. Just 40 calories or 1 WW Freestyle SmartPoints each! Pre-heat the oven to 400. Line a baking sheet with parchment paper and lightly mist the paper with cooking spray. Fill a small dish with water and set it beside you on a clean, dry work surface (like a cutting mat). Lay a wonton wrapper on the mat. 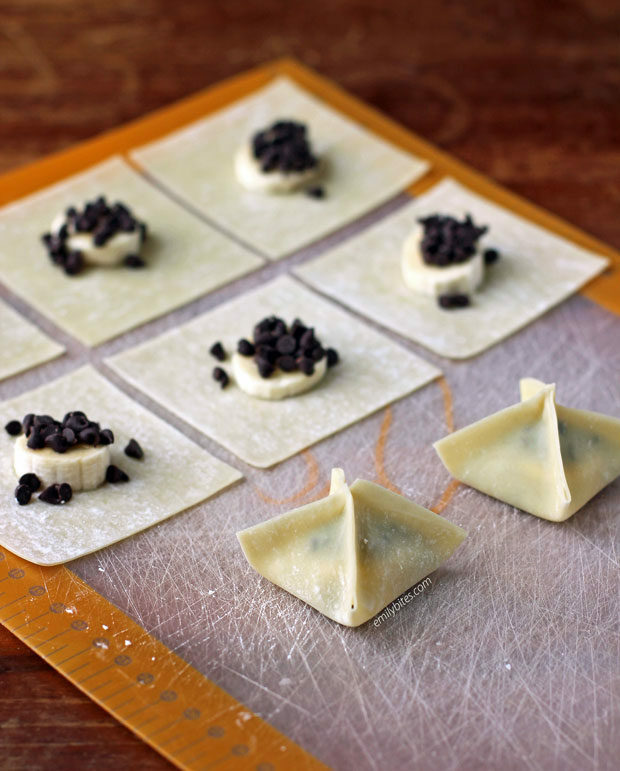 Place a banana round in the center of the wonton wrapper and top it with ½ teaspoon of mini chocolate chips. Dip your finger into the dish of water and run it along the entire outside edge of the wonton wrapper, corner to corner, creating a square of wet around the edge of the wrapper. Gather the four corners of the wrapper and bring them to the center, pressing them together. Use your fingers to press together all the edges of the wonton wrapper to seal the wonton bite closed. Place the finished bite onto the prepared baking sheet from step 1. Repeat steps 2 and 3 with remaining ingredients to create 8 wonton bites. Mist the tops of the bites with cooking spray. Place into the oven and bake for about 10 minutes until the X at the top of the wonton bites are golden. Sprinkle the powdered sugar over the tops of the wonton bites and serve.